Cocktail hour & Mariachi band begins at 6:00 p.m. Program & Dinner begin at 7:00 p.m.
Table Sponsors receive their company name and logo printed in the dinner program and 10 complimentary dinner tickets. Patron Sponsors receive their company name printed in dinner program and 4 complimentary dinners. Supporting Sponsors receive their company name printed in the dinner program and 2 complimentary dinner tickets. Door prizes We are looking for sponsors for large door prize items such as a tablet, television, travel package, etc. Proceeds from ticket sales go to the California Strawberry Commission for Scholarships. If you'd like to donate a prize please email alex@santamaria.com with a description of the item. Items must be delivered to the Chamber office at 614 S. Broadway, Santa Maria before April 1st. 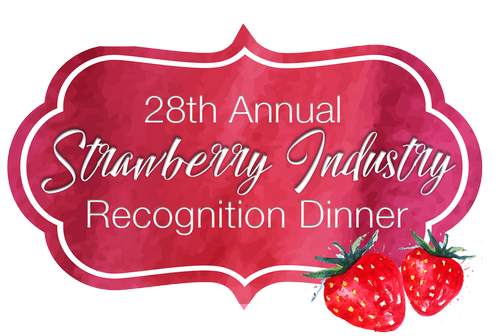 Join us as we pay tribute to the people who grow and harvest one of Santa Maria's most important commodities, The Strawberry! Want to be a Sponsor ? Contact our office for details!